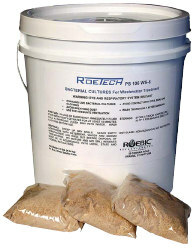 Roetech 106 PS | Agricultural Waste Management Products | RoeTech Bioaugmentation with Bacteria Cultures | We Make Water Clean. Roetech 106 PS is a highly concentrated mixture of spores and vegetative bacteria. Six patented Bacillus bacteria combined with Pseudomonas species provide a multiple enzyme producing culture with enhanced capacity to degrade surfactants, hydrocarbons and other chemicals in addition to standard sewage components. This blend is offered as a bulk powder and in 8-ounce water-soluble packs. Applications include municipal wastewater, food processing, livestock manure ponds, aerated septic tanks, or aerated treatment units (ATU's). The extra activity in 106PS is ideal for hog slurry operations. Controls ammonia and hydrogen sulfide gases.